I actually painted something for me. Now I'm thinking that there are others out there like me. You design and create things all the time, but usually sell them, right? It's kind of like the mechanic who never works on his own car. Enter the table my mother gave me years ago that has really had a hard life. and a big crack down the center of the top. hubby and I were in the process of remodeling our family room. As you can see by my photos it was a concrete floor construction zone. 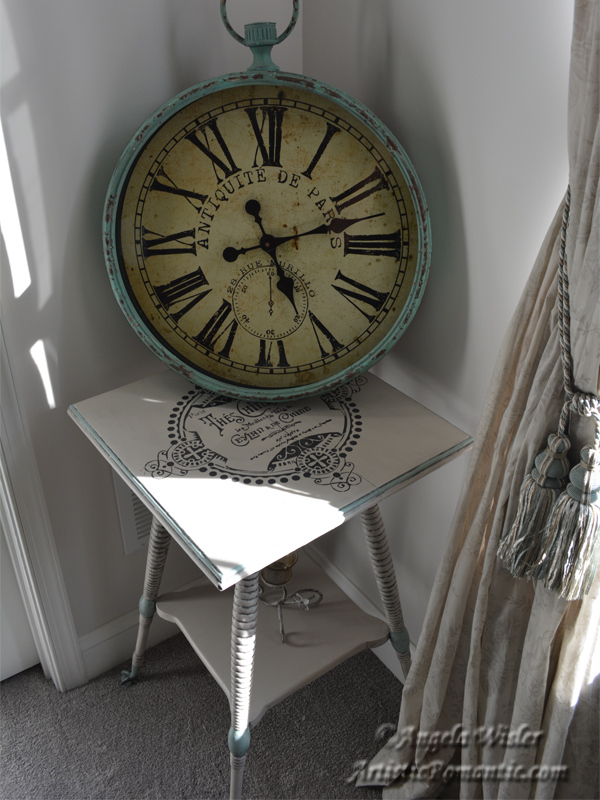 Anyway, I have used Annie Sloan chalk paint before. I wanted to try the new DecoArt Chalky Paints. I purchased them at Home Depot. I started out by using their Stain Blocker. Per the instructions I painted it on and let it dry for five days. I used a foam roller and a good Purdy paintbrush. Next it was time for the paint. I choose the color Primitive. It is a lovely taupe that goes great with grays or beige. The chalky paint was thicker than Annie Sloan paint. I like a smooth surface, so I watered it down to apply it. It took two coats to cover. I decided to accent the table with Annie Sloan Duck Egg Blue. As you can see above, it covered beautifully. All of the nasty stains were gone. Yea!! and it is sooooo ridiculous. I have never stenciled before. There I admitted it. It's true and out there for all to know. I know I'm a painter, but I never stencil any of my work. I was really nervous about this stenciling part. 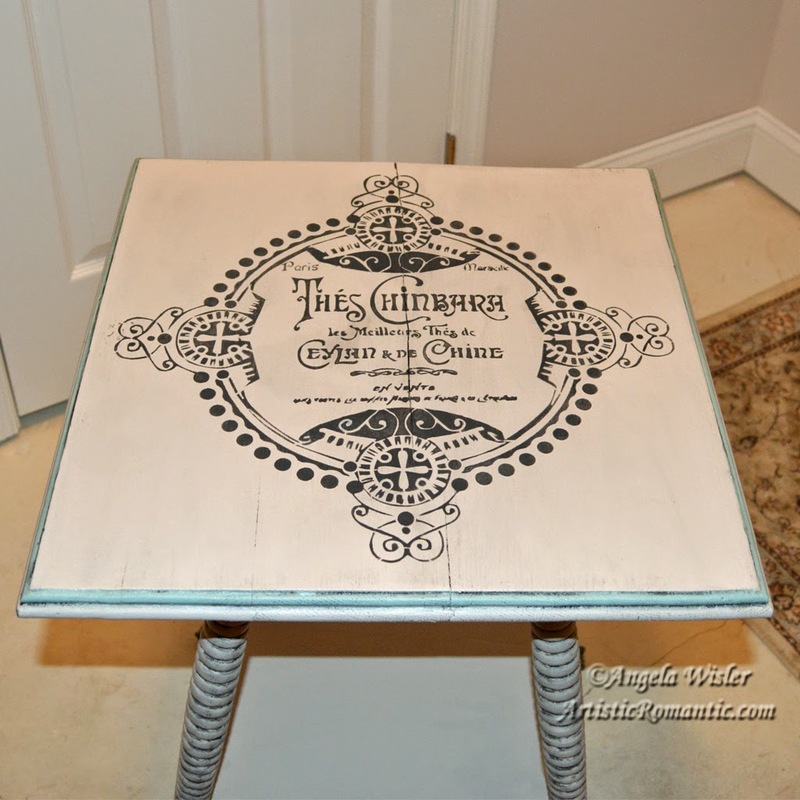 I used a foam roller and some Annie Sloan Graphite chalk paint. it seemed a little bland and flat. So I decided to glaze the table. 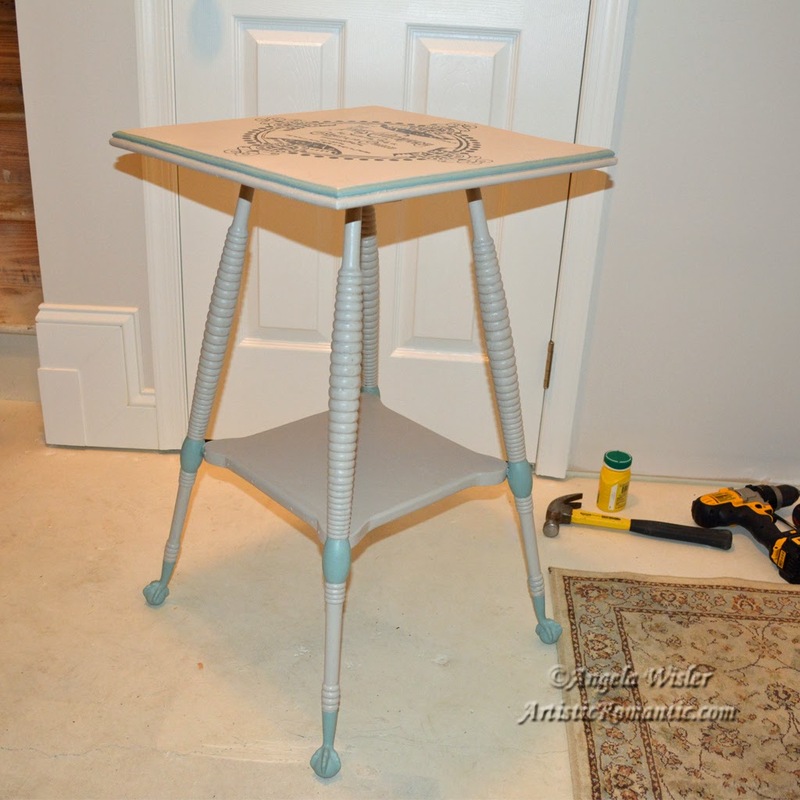 I used Behr faux glazing medium mixed with Annie Sloan Graphite chalk paint. Wipe or brush it on, let it collect in the recesses, and wipe it off. After glazing with Behr faux glaze and Annie Sloan Graphite. And as you can see we no longer have concrete floor in the family room. 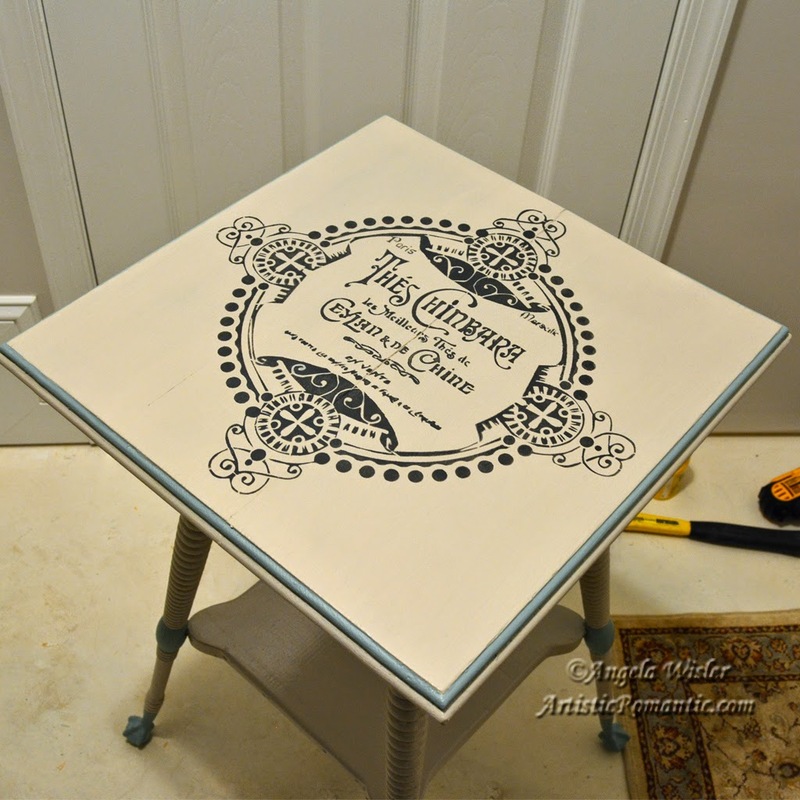 I was very pleased with the DecoArt Chalky Paints. 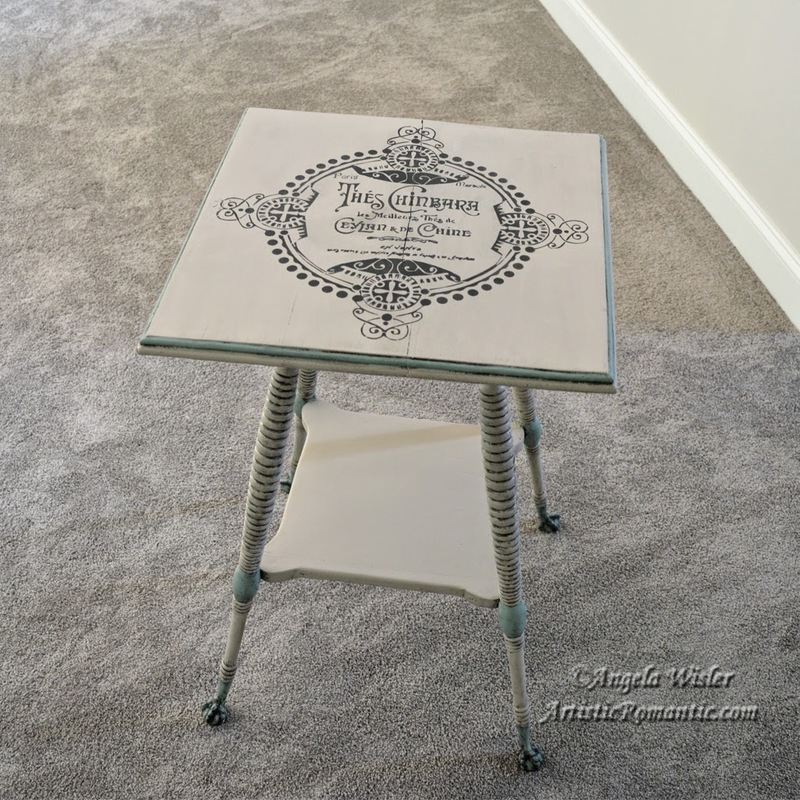 Hi Angela, Love your table and the design is wonderful. Great use of the color and the graphic is perfect. Glad you are keeping this for you. Some time we just have to give ourselves a little treat. I am trying to do this on occasion too. Enjoy and thanks for sharing. I have started using the DecoArt chalk paints and ordered a bunch from the Artists Club as they have been on sale there. I like them too Try the site , www.ArtistsClub.com You did a great job on the stencil. I have stenciled for years and love it. I bet you do more right?? Have a great week and 4th of July. Beautiful table, Angela. I wanted to try the chalk paint from Home Depot, but they don't carry it in my store and it's hard to tell what colors will really look like when you buy them from the internet. Do you think the quality was the same as the annie sloane paints? Do you usually wax your pieces? Thanks for your comments. I really did like the chalky paint and in my opinion it performed equally as good as the Annie Sloane paints. I did not wax this piece. 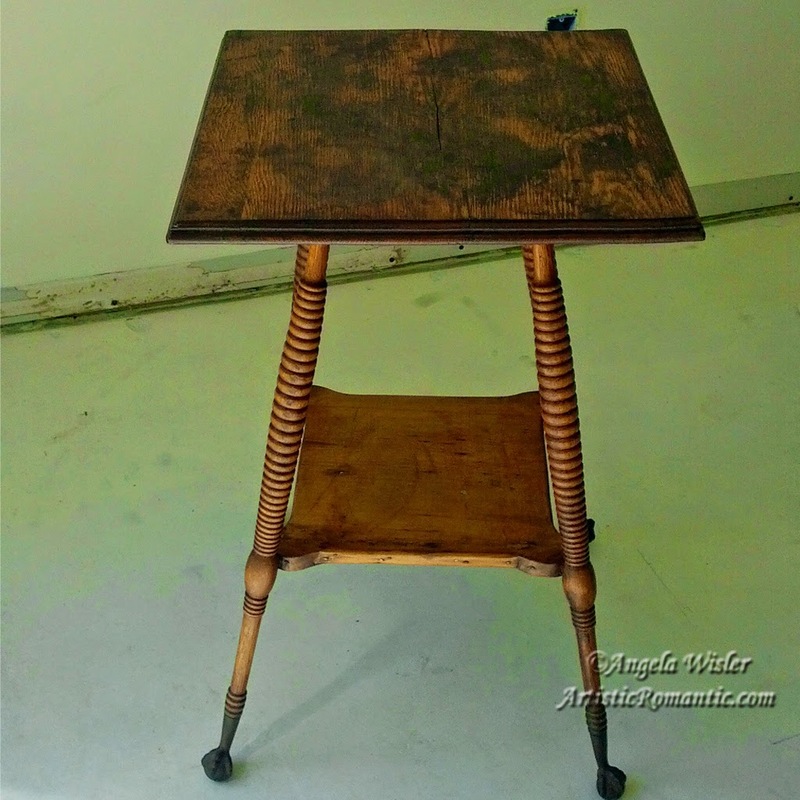 I have used Annie Sloane wax with her paints on a few furniture pieces. 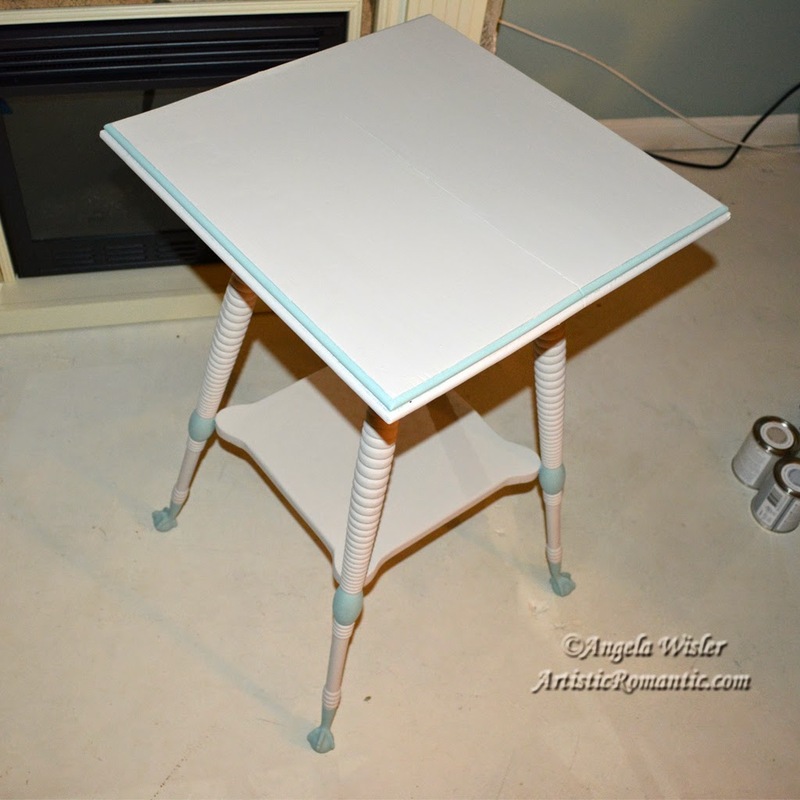 I wanted a harder finish on this table, so I went with DecoArt's Light Satin Varnish. Honestly, after being a decorative artist for many years, I prefer varnish to wax when it comes to protecting paintings. The wax is a good product, varnish is just my personal preference. If your home depot doesn't carry them, I know Michael's craft stores are carrying them in stock (if you have Michael's near you) I found the colors I ordered were very true to the decoart website's photos. Have a great day and happy painting! Angela you did such a beautiful job on this table, but honestly that doesn't surprise me. Thank you for sharing your tips, I so want to get started painting, but we do not have a Home Depot around us, nor a Hobby Lobby which means I have to order just about everything online! I am going to share this finished product picture in our group on facebook, Shabby Vintage Junkin Sisters Marketplace. Have a great weekend! Thanks so much. I'm glad I could help. I look forward to seeing your projects. I know they are going to be fabulous.